For as long as I can remember, I have loved sculpture. Watching my father, mother, and sisters transform square blocks of wood into beautiful pieces of art created in me a lasting fascination with subtractive sculpture in particular. At a relatively young age, I made a definite choice to pursue wood as a medium. One reason is simply that my family has carved wood now for three generations, so I have real-time experience in working with the different challenges it presents. The more important reason to me is that as I grew up and became more involved in woodcarving, I came to see it as a mostly forgotten, almost scorned, art. Wood has a warmth and pliability that stone of any kind does not offer. By continuing to show and teach this skill, I would like to change people's minds about the elegance and worthiness of this unique art. 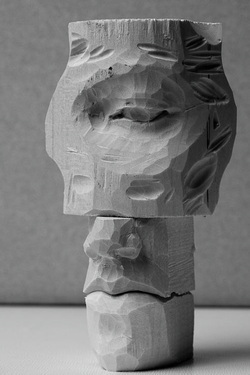 I have now carved for 20 years and have taught and shown my work extensively. My true goal is to capture a story or an emotion with my pieces that someone can relate to and connect with, and my hope is that this is readily obvious in my work. The simple utility of carving wood has been a challenge to learn even despite my early roots, and this, along with the added challenge of learning how to express myself through my art has truly born out the wisdom of the old adage that the more you learn, the more you are made to realize you know nothing. Someone could study it for many lifetimes, perhaps infinitely, and still have so much more to understand. I am enjoying this process, and I hope you can enjoy the results. Email me with questions about items for sale, seminars, etc.